An adorable Halloween design by Lizzie Kate. This Halloween greeting is stitched on eerie EEK! fabric from Picture This Plus, which is a great faded orange with grayish/black swirls. 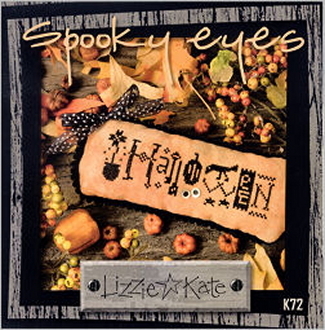 The "spooky eyes" are a set of mother-of-pearl buttons topped with tiny black buttons. Kit contains: EEK! 28 ct. fabric, hand-dyed black mini pom trim, skein of Weeks Dye Works kohl thread, mother-of-pearl buttons, tiny black buttons, and finishing instructions. You supply a bit of fabric from your stash for the backing to make into a pillow. Finished design: 6" x 1.75" ﻿ with a stitch count of 84W x 25H.